What Else Can Bitcoin Buy You In M'sia? Add Custom T-Shirts To The List. Malaysian custom t-shirt manufacturer SaltyCustoms will now accept cryptocurrency as a means of payment. They will first begin accepting crypto payment through their online configurator as well as larger orders. It seems inevitable that we’ll all end up using cryptocurrency. Earlier this week, coding school Next Academy announced that they now accept it for school fees. As more businesses begin to warm to the idea of accepting Bitcoin, Ethereum, and other forms of crypto as payment, Malaysian custom tee manufacturer SaltyCustoms has jumped in and announced that they will be the first apparel company in Malaysia to accept cryptocurrency payments, beginning end of January. 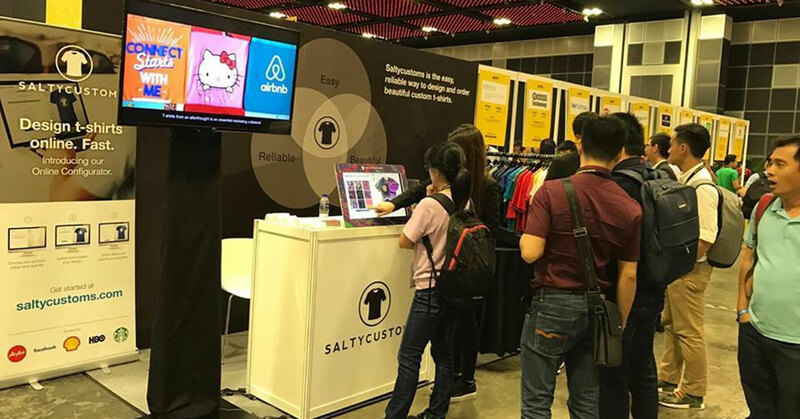 For the unfamiliar, SaltyCustoms is a Malaysian-based custom apparel manufacturer that supplies personalised T-shirts to businesses, with notable clients including Coca-Cola, Facebook, and HBO. Launched in 2010, the brand now supplies custom tees as a one-stop platform with design, manufacturing, and logistics all being handled within. Since starting out, the company has developed numerous verticals to supplement their business including LAUNCH, a platform allowing businesses and influencers to create and sell tees with their own designs, as well as their individual custom t-shirt designer app Doobie. The team told us that they will be accepting Bitcoin and 45 other altcoins. With the company heading towards MSC status this year, the decision was made unanimously by the directors of SaltyCustoms toward the end of 2017. This move also comes as Bank Negara Malaysia attempts to figure out how to regulate cryptocurrency transactions within the country. “As regulators around the world—not just Bank Negara Malaysia—are looking for a viable and sustainable way to regulate cryptocurrency, we acknowledge the fact that this may take some time,” their leadership said. And despite some foreign governments deciding to altogether ban the use of cryptocurrency, SaltyCustoms feels optimistic about adopting this form of payment. Consequently, SaltyCustoms believes that this move will enable them to become a globally relevant company, and hope to be among the brands pushing Asia’s economy forward. “We hope to see our other e-commerce platforms follow suit,” said Calvin Tee, Director of Tech. “We believe that improving the way customers buy and transact online will allow the e-commerce industry a chance to grow even quicker, giving our customers more choices”. SaltyCustoms will first begin accepting cryptocurrency for orders through their online configurator as well as for larger business dealings, with the rest of their offerings to follow suit as the year progresses. For more information on SaltyCustoms, visit their website or check our their Facebook page.